RPPG is proud to be the nations largest supplier of aftermarket parts for Gordon-Piatt* burners. Even though G-P no longer exists there is no reason to replace a perfectly good burner simply because a part has failed. Click below to see our Burners page for more information. RPPG has the privilege to employ some of the most experienced and knowledgeable people that are experienced in all facets of what we do. 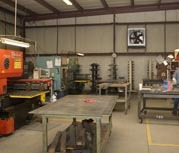 Management alone has over 100 years experience in the burner business and custom fabrication. The shop floor is filled with some of the most experienced craftsman available. In 2007 we purchased a Mazak laser cutter that brought, “farmed out” parts back in-house and made us much more competitive in the market place. Don’t forget support and Research and development. In today’s rapidly changing marketplace we value the traditional. The smallest of our products is tested just as thoroughly as the largest. We design for durability and performance. It is proven here and supported out there. All we ask is the opportunity to prove ourselves to you. You will not regret it. Copyright 2018 Reliable Power Products. All rights reserved.